In honor of Teacher Appreciation Week, I want to single out one of my favorite teachers—one who really made a difference in my life. Her name is Betty Wilgus, and she was my 1st grade teacher. I know it’s hard to imagine that I remember what it was like to be in the 1st grade! But I do, because you always remember how people made you feel. And Mrs. Wilgus made me feel loved. She met us in the classroom each day with a vibrant smile and a warm pat on the back. I vividly remember how very loved I felt in her classroom and what a nurturing environment she provided. She was patient. She was kind. She cared about her students. 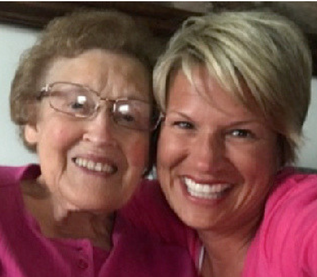 This past week, I thought how nice it would be if I could tell Mrs. Wilgus face-to-face how much she mattered to me and probably to countless others. So, knowing that she still lived in my hometown, I decided to pay her a visit. Mrs. Wilgus had the biggest smile on her face as she thanked me for telling her this. She said it’s nice to know that what she did mattered. Teaching was very important to her, and she so believed in educating students. The reason she chose teaching is because she loves children so much and that she always wanted her students to truly love school, and especially to learn to read because she felt that was the foundation of other learning. We went on to chat about various topics including our common love of books, spirituality, and the goodness of life. At 83 years old, Mrs. Wilgus still lives a very vivacious life. One filled with her strong faith, a loving family, and a sense of purpose and meaning. I felt so good getting to know the 83-year-old version of my 1st grade teacher. When I left, she looked me straight in the eyes and said, “Kim, I’m so proud of what you are doing as a teacher.” My eyes definitely welled up just a bit. All of us need to know we are making a difference. So, here’s my challenge to you: If you have a favorite teacher, find out their address and pay them a visit. Or if you can’t manage an in-person visit, write them a note. Take a moment to let them know that their service to you mattered. That WHO they are as TEACHERS MATTERS. If you accept my challenge, I hope you’ll share a quick story of how your visit went. Share a picture of the two of you together, or of the note you sent. And be sure to describe what their reaction was—that’s the best part! This Teacher Appreciation Week (and all year long), let’s gift our teachers with some gratitude for their devotion to this very noble, sacred profession!